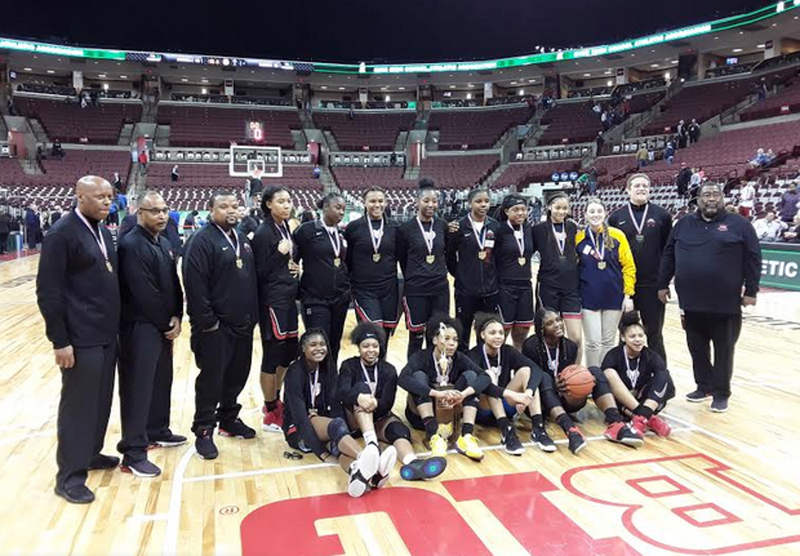 The 44th Annual Ohio State Girls Basketball Tournament took place March 14-16, 2019, at the Jerome Schottenstein Center on the Ohio State University campus in Columbus Ohio. This year, Ohio had several of the top teams in the USA. Three of the four that MaxPreps ranked made it to the Final Four in their respective classes (Cincinnati Mount Notre Dame and Pickerington Central in Division 1 and Columbus Africentric in the smaller Division 3). Semifinals were Thursday and Friday with all finals on Saturday. 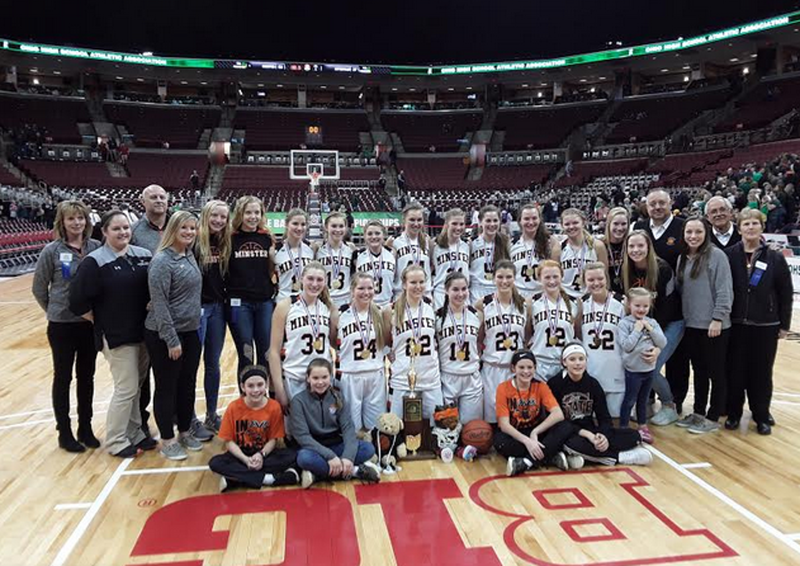 For girls basketball, the Ohio High School Athletic Association (OHSAA) looks at prior year’s female enrollment of grades 9-11 (figuring the seniors are gone the next year). Thus, when you are trying to figure roughly how big a school’s student population is, you need to divide by 3 and add that number (guessing classes are close in number) to get the female enrollment. Assuming about as many boys as girls, double that number and you should get close to a school’s actual enrollment for co-ed schools. A number of private schools (such as State Champion Cincinnati Mount Notre Dame) are girls only. The OHSAA divides the teams into four divisions of approximately 200 schools. Division 1 is the largest sized schools ranging from over 3000 students to about 1000 in grades 9-12. Division 2 ranges approximately from approximately 900 down to about 500 students. Division 3 varies from about around 500 down to about 300. Division 4 (smallest schools) with enrollments goes from about 300 students to under 100 in grades 9-12. Many states (often football driven) have more divisions with tighter enrollment ranges. Sadly, this has often led to a lower level of play (including embarrassing blowouts) at levels as high as the state semifinals. Not to say Ohio does not have blow-outs in its Final Four, at least its system makes it less likely to happen. Girls basketball is not as numbers driven as football yet so many state governing boards continue to be overly obsessed with counting numbers. They then created so many classes that the winning of a title has become less meaningful with the “everybody gets a trophy” philosophy in charge. To its credit, Ohio has largely avoided this sticking to just four classes. Special thanks to the OHSAA’s Senior Director of Communications Tim Stried and his staff who supplied comprehensive box scores for each quarter as well as a special media guide which gave writers all kinds of useful background and stats on players and teams. Well done! Being in Ohio, it is customary to name the town and then the school. When only one name is mentioned, the town and school share the identical name. In Division 1, the final was billed as a battle of well coached, talent laden, nationally ranked teams. It was a great game for three quarters and then Mount Notre Dame got hot as Pickerington Central appeared to tire a bit. Toledo Rogers had the two best players in Division 2 and in the end that spelled the difference as much as anything. For whatever reason, teams in Division 3 did not play at as a high level as their records would have made one expect. In the end, nationally ranked, highly talented Columbus Africentric (which beat Mount Notre Dame early in the season) prevailed while not at its best. Conversely, Minster looked sharp in dominating Division 4. Minster beat Division 2 finalist Carroll earlier this year and showed all present, it was a good team, not just a good Division 4 school. Winners in Divisions 2, 3 and 4 were all repeat champions from last March. Mount Notre Dame came into the game ranked in the top 10 nationally by MaxPreps and looked it being up 33-14 at half. The second half was played about even. With four starters back, look for GlenOak to move up the Ohio rankings next year. Key to this victory was first half points off turnovers (12-2) favoring Mount Notre Dame. Central was the clear favorite coming into this game yet the contest was not decided until the last few minutes. Central was in fact only up four with under two minutes left. A subtle issue here was Central’s leader was a senior point guard in Penn State signee Madison Greene (led with 14 points) who had the ball as needed. Conversely, Notre Dame Academy’s featured player was freshman forward Grace VanSlooten (6-2 forward; led with 15 points). In crunch time, this national top 50 freshman barely got touches as the older (mostly senior) players tried unsuccessfully to keep the team close. Both teams came in nationally ranked in the top 20 by MaxPreps. Both sported starting lineups of future Division 1 players. Pickerington Central was the deeper with Mount Notre Dame a bit more structured. Both showed excellent defensive prowess in their semifinal games. There was not much separation between the sides for three quarters. The first quarter was the most methodical with Central up 13-9 working to crack the Mount 1-3-1. Its man defense appeared very stout. The second quarter saw Mount Notre Dame defense switch to man. It held Pickerington Central to 1/11 from the field but the halftime lead was only 19-16 favoring the team from Cincinnati as Central had 21 shots to 12 for Mount Notre Dame. After three quarters, the spread remained at three (32-29). Notre Dame was shooting better in the period 5/9 versus 5/14 for Central which for the game got 51 shots from the field to just 29 from Mount Notre Dame. Mount Notre Dame played just five players until the last minute compared to eight logging at least a quarter’s time for Central. Yet Pickerington’s team seemed to tire first as Notre Dame conversely appeared more energized. With about six minutes left, the Notre Dame was up 36-29 and ballooned to 42-29 by about the four-minute mark. A pair of threes by Mount Notre Dame’s Gabby Marshall (5-8, Iowa commit senior, guard) were daggers! Game over! In quarter four, Central shot 1/16 from the field to Notre Dame’s 6/8. Mount Notre Dame was led by Loyola of Chicago signee Julia Hoefling (6-0, senior, forward) with 14 points. It must be noted that each starter played a major role (8 points minimum per starter). 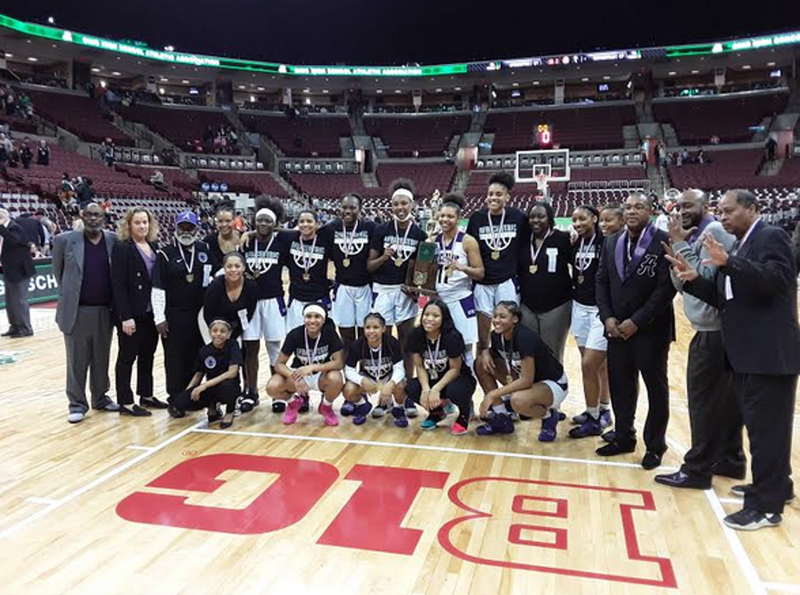 Pickerington Central was again led by Madison Greene with 10 points on 4/15 from the field. 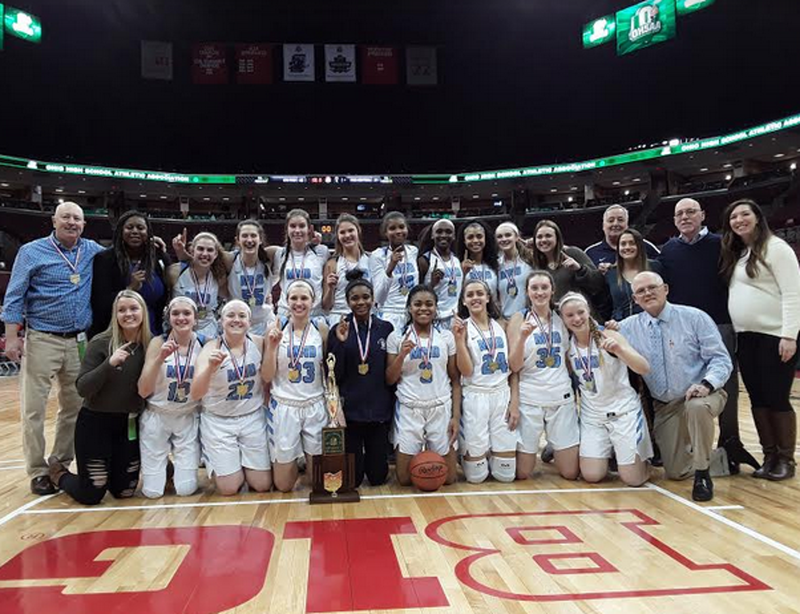 Mount Notre Dame won the title in 2017 and Pickerington Central in 2018. Each school has now won seven Ohio state titles. Carroll came in as the favorite ranked as the better in-state team. After a relatively close first half (26-20), Carroll broke the game open in the third quarter in large measure to going 4/4 from behind the arc to St. Vincent-St. Mary going 0/2 from deep. Also, Carroll went 5/6 from the foul line to 2/6 for its opponent resulting in a 19-8 scoring edge in the third quarter. Carroll freshman guard Sarah Ochs (5-5) led all scorers with 14 points. Sheridan was considered to be the underdog to Rogers with two likely future Power 5 players on its roster. Still Sheridan hung around trailing 25-18 at half and 40-36 after three quarters thanks to a strong offensive rebounding edge (18-6). However, Rogers had senior guard Zia Cooke (5-9). The South Carolina signee scored 37 points (be it on 9/24 from the field) including 18/21 from the foul line and pulled in 12 of 28 of her team’s rebounds. Freshman post Faith Stinson (6-1) led Sheridan with 16 points and 13 rebounds. Sheridan deserves extra credit hanging in with one of its top two starters injured playing less than one minute of the game. Rogers was slightly better over the course of the game but could never really pull away, up 41-31 after three quarters. Often, Rogers would force an error and then commit one on its own negating its hard work. The difference was better shooting from the field (20/45 for Rogers to 16/51 for Carroll) along the superior Rogers talent. Sophomore 5-11 forward Madison Royal-Davis finished with 17 points but also contributed 8 rebounds and 7 assists playing all over the court. McDonald’s All-American Zia Cooke (13 points in final) was just not going to lose her last high school game. Carroll’s junior post Julia Keller led Carroll with 17 points and 6 rebounds. Africentric had won close games against Hiland the past two season. Another was anticipated in spite of a wide gap in talent with Africentric having multiple major D1 prospects to Hiland with a couple of young mid-major prospects on its roster. The game remained close into the fourth quarter as Africentric only led 40-35 after three quarters. Numerous times Hiland players was able to drive past Africentric defenders scoring at the rim as help did not show up. What spelled doom for Hiland was Africentric pressure late in the third and early in the fourth periods forcing Hiland errors. Key stats leading to Africentric’s win were 17 to 4 in points off of turnovers and 10-0 in fast break points. Alexis Smith (5-8, junior, guard) led Africentric with 19 points (8/17 from the field). Morgan Yoder (5-8, sophomore, point guard) led Hiland with 21 points (8/17 from the field). From watching Waynesville here, it appears they know how to win ugly. The redeeming feature of this contest was that it was competitive with a buzzer-beater ending in overtime. Short of that, the game had too many unforced turnover and bad shots taken. This is not what you would expect of two teams that entered the game a combined 41-1. The hero of the game was Waynesville’s Marcella Sizer (6-0, senior, forward) who made the overtime winning put-back finishing with a team high 13 points. Chippewa was led by Celina Kontz (5-11, junior, forward) with 20 points. Both teams came in 26-0. However, Africentric started a lineup full of Power 5 talent compared to Waynesville with players more likely to find their way into Division 2 or 3 ranks. The word in the arena was the flu was going through the Africentric team with one player wearing a safety mask postgame substantiating the report. With about 4:30 left in the second quarter, Africentric was 3/22 from the field. While this improved to 15/55 (27.3%) for the game, what saved the locals was a 26-3 edge in offensive rebounding for the contest. Africentric led 39-24 after three quarters but 2/9 shooting in the final stanza allowed Waynesville to plug away cutting the lead to the final margin in the dying seconds. One has to credit Waynesville for staying in this contest. Africentric was led by McDonald’s All-American Jordan Horston (6-1, senior, guard) with 15 points but just 3/20 from the field. Waynesville was led by Rachel Murray (5-7, senior, guard) with 15 points (3/7 from the field). Africentric will finish the year ranked in the top 10 nationally thanks to quality wins over Cincinnati Mount Notre Dame and Detroit Edison during a 28-0 season. This may not have been Africentric’s best effort but when you repeat as a state champion (seven in school history), you can leave the arena with the feeling of a very successful season. Minster was the favorite and it clearly showed being up 34-19 at half. Things got no better after halftime. For the game Minster’s Courtney Prenger (6-2, senior, power forward, Xavier signee) dominated in the paint with 18 points and 9 rebounds. Meanwhile Minster’s sophomore point guard Ivy Wolf (5-8) was keeping the offense running smoothly racking up 6 assists to only 2 turnovers while scoring 12 points. For the game, Minster shot 27/47 from the field compared to 10/33 for Cornerstone Christian. Cornerstone returns all but one starter and should have a good chance of going further in the playoffs next year while Minster losses a lot of players to graduation. This was a very competitive affair pitting Ottoville’s ability to score in the paint (26-12 edge vs Shadyside’s three-point shooting (making 8 to 3) over the course of the game. Ottoville led 23-16 at the half with the second half about even. Ottoville’ senior guard Kasey Knippen (5-7, committed to Urbana University) led al scorers with 20 points while Shadyside’s sophomore guard Baylee Wach (5-6) led her side with 17 points. These teams had played earlier this year with Minster winning 46-28 as well as in last year’s final (a Minster win). Both teams brought large followings as is often the case compared to bigger schools where towns have multiple schools to support and school spirit is often on the whole less. Plain and simple, Minster dominated with size (and talent) in the paint (28-14) which mirrored the final margin. Minster’s Prenger controlled the middle with 16 points and 8 boards but got scoring help from sophomore guard Janae Hoying (5-6) with 19 points including 3 threes. Only senior guard/forward Haley Hoersten (5-7) reached double figures with 10 points for Ottoville. Word in the gym was Minster was considered to be one of the top 25 teams regardless of class in Ohio this season. They had a good team concept with likely future Division 1 players in Courtney Prenger and Ivy Wolf to anchor the efforts. Ottoville with around 60 girls (small for even this class) in the high school had nothing to be ashamed of by its showing in Columbus!